Are you interested in learning more about the history of people who lived in Europe between 500 and 1500 A.D.? Below you can find helpful information for your research or check out our Medieval Manuscript Digital Collection with over 5,600 items. Another website from the British Library highlighting their treasures, including the Lindisfarne Gospels. Want to know more about the most popular type of book -- the "bestseller" of the Middle Ages? This site gives the nuts and bolts of the contents of these books and how they were used. Created by the Institute for Studies of Illuminated Manuscripts in Denmark. An online exhibition exploring French culture through manuscripts and rare books. Glossary of terms for the description, contents, and production of the medieval manuscript book. This site by Glenn Gunhouse offers the opportunity to see the contents of a typical book of hours in both Latin and English translations. An online catalog of illuminated manuscripts in the collections of the Royal Library and the Museum Meermanno in The Hague, Netherlands. This site features a highlights tour organized by theme and a user-friendly search engine. The Free Library of Philadelphia’s digital collection of medieval and Renaissance manuscripts. This site by Jean-Luc Deuffic is the only blog dedicated to the study of illuminated medieval manuscripts. Deuffic writes in French but has recently started providing English translations for his entries. Check out what he has to say about different manuscript topics and practice your French at the same time! "Pecia" means "piece" in Latin and is the name for a system used for copying texts in the Middle Ages. An online catalog created by the British Library giving access to one of the most significant collections of medieval manuscripts on the web. Easy to use for the novice as well as the scholar. An interactive, animated website on the creation of illuminated manuscripts. 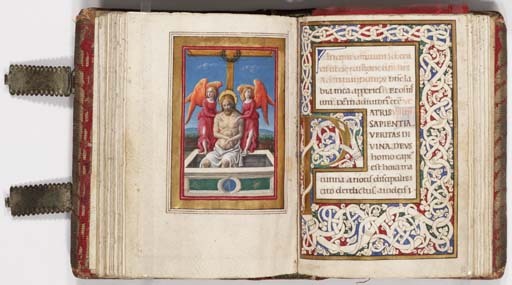 Gives an overview of the most popular type of book of the Middle Ages -- the book of hours -- using examples from the collection of the J. Paul Getty Museum in Santa Monica, CA. Digital facsimile of the Murthly Hours, a book of hours of circa 1280 and one of the great treasures in the National Library of Scotland. The paleography (art of analyzing and reading handwriting) and calligraphy of Medieval books. Appreciating the history of Medieval books. Fiction that draws upon medieval themes.